Fine in Fine jacket. 1629724122 Dust jacket and book are clean, has a very good binding, no marks or notations. New. Sewn binding. Cloth over boards. 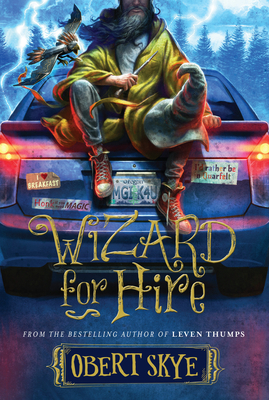 416 p. Wizard for Hire, 1. Intended for a juvenile audience. Fine. Sewn binding. Cloth over boards. 416 p. Wizard for Hire, 1. Intended for a juvenile audience. In Stock. 100% Money Back Guarantee. Brand New, Perfect Condition, allow 4-14 business days for standard shipping. To Alaska, Hawaii, U.S. protectorate, P.O. box, and APO/FPO addresses allow 4-28 business days for Standard shipping. No expedited shipping. All orders placed with expedited shipping will be cancelled. Over 3, 000, 000 happy customers. New. Sewn binding. Cloth over boards. 416 p. Wizard for Hire, 1. Intended for a juvenile audience. In Stock. 100% Money Back Guarantee. Brand New, Perfect Condition, allow 4-14 business days for standard shipping. To Alaska, Hawaii, U.S. protectorate, P.O. box, and APO/FPO addresses allow 4-28 business days for Standard shipping. No expedited shipping. All orders placed with expedited shipping will be cancelled. Over 3, 000, 000 happy customers. New. 1629724122 Brand New Direct from the Publisher! Not overstocks or marked up remainders! Ships in a sturdy cardboard container with tracking!